It will be implemented during 6 months from September 2009 to February 2010. The main beneficiaries are civil society organizations. Other beneficiaries include media, general public and other stakeholders. The activities will vary from trainings, workshops, production and dissemination of information materials, and field studies on climate change adaptation initiatives and best practices. Lack of information and unconsciousness of Rwandan communities on climate change slow down efforts to mitigate climate change challenges. Over the past 14 years, Rwanda has made significant progress in rebuilding economic, administrative and judicial infrastructures devastated by the 1994 genocide. Rwanda has also made advances in environmental protection, and measures have been taken to tackle problems related to environmental degradation. Rwanda’s population of more than 9 million is one of the most densely concentrated in Africa, and fertility rates are among the highest in the continent. In a rain-fed agrarian economy with a high rate of poverty and food insecurity, climate change sharpens its claws for potentially devastating impact. Any reduction in rainfall will damage farm yields whilst extreme or torrential downpours will hasten the process of soil erosion. 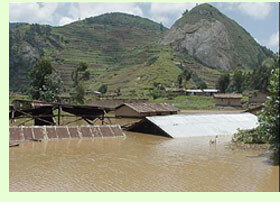 All these problems are seen in almost all the regions of Rwanda, and more specifically in the Nile Basin region, which covers more than 80% of the national territory. Experts say population pressure has led to a rapid degradation of the wetlands and forests over the past two decades, making the population prone to hazards of climate change. It is estimated that in the past two decades, Rwanda has lost about 60 percent of its forest cover. This situation put most of the population vulnerable to climate change with very limited capacity for adaptation. Despite recent advances in environmental protection, Rwanda still faces many challenges in implementing a comprehensive and sustainable environmental policy, while political will is strong, traditional, cultural, poverty and lack of adequate behavior change strategy exert a strong influence, and existing government and civil society institutions at every level lack the knowledge, skills and capacities to fully act on changing local population mindset and practices. Rwanda has been prompt on climate changes by trying to help its population in various ways through propositions on adaptation and mitigation. However, community members and other stakeholders are not aware of these national priorities and their roles and responsibilities in implementation. During the national roundtable on climate change, which took place in May 2009 in Kigali, and in which NBDF Rwanda presented on the role of Civil Society Organizations on climate change adaptation, it was emphasized that lack of information, knowledge and capacities are the main challenges for stakeholders at all levels to address climate change issues. During that roundtable, NBDF presentation highlighted the opportunity of working with its members which are very active on the ground but lack information and knowledge to integrate climate change in their interventions. All these objectives are linked to ongoing initiatives: if achieved, they will be an entry point to achieve the 6 national priorities of NAPA as stated above. An aware and informed civil society will bring its members and the local communities to be able to reduce the vulnerability to climate change risks. Knowledge and information are among the priorities of Economic Development and Poverty Reduction Strategy (EDPRS) and the long term planning for Rwanda which is commonly known as “Vision 2020” “Skills for knowledge based society”.